Week one is almost over - we hope you had a cracking time of it! Now week two of the Easter holidays is on the way, which means we’re even closer to unboxing and devouring our chocolate eggs - hopefully lots more sunshine to burn off all that steam - yay! Our week two guide covers Monday 15th - Monday 22nd April..your great ‘egg-spectations’ are accurate - this one’s a biggie! We’re excluding Easter egg hunts from this particular article, mailnly because it's huge, but also because we have a whole article dedicated to those HERE! Sudeley Castle continues to deliver some cracking Easter egg-citement! Spring into the season by taking part in events going around the castle - find and follow the chicks hidden around the grounds, can you spot them all? Open 10am – 5pm daily (running until 28th April) and general Admission applies. Find out more. Okay, so The Great Brewery Easter Hunt may have snuck through into our guide - we won’t tell if you don’t! Enjoy a special Easter challenge for youngsters to piece together, with the help of a grown up's mobile device! Hidden around The Brewery Quarter are nine clues that when hunted down each reveal a letter. Once all nine are collected they form a secret word! When little ones have solved the Easter-themed anagram, they’ll be in with a chance to win a fantastic family-friendly prize package worth over £250. Easter Hunt trail runs until Monday 22nd April. Find out more. Although we have a guide for Easter Camps here, this little mini egg has snuck through too! Cotswold Clubhouse is hosting a fab activity camp, full of fun and exciting days for young ones! Kids can learn new skills, enjoy activities, and exercise, as well as enjoy open play, a bouncy castle, soft play and arts and crafts! Running daily until Thursday 18th April. Find out more. The Easter holiday schedule at Cheltenham Science Centre offers a hive of activity for the family! Various drop workshops cover all aspects of science in an entertaining and relaxed format, so little ones are free to learn at their own pace. From slime, to robots and spaghetti - you’re guaranteed to learn something new! Running until Saturday 20th April. Find out more. Chedworth Villa is transporting us back in time to an Easter gone by, Roman style! You can follow the trail, dress up in Centurion costume, play with Roman toys, get creative with Easter crafts and get a glimpse of Roman life with Chedworths' Romans! Running 6th - 22nd April. Find out more. Easter Holidays mean the free, My Pet Pals Workshops are back! Held at Pets At Home Gallagher Retail and Golden Valley stores, these sessions help teach ages 5-11 children (and their grown ups) how to love and care for animals, encouraging empathy and understanding. Kids up close and personal with all of the small furry friends in-store, and provide a 'hands-on' approach to pet care. Running daily until Sunday 22nd April. Find out more. There’s a host of egg-citing Easter events and activities taking place at Birdland throughout the holidays. As well as Easter trails, quizzes and daily egg-themed talks and shows, Birdland is also expecting some egg-stra special new arrivals in their hatchery! Easter events running daily until Sunday 28th April. Find out more. The Amazing Bubbleman a.k.a Louis Pearl has been thrilling audiences worldwide for over 30 years with the art, magic, science and fun of bubbles! Louis explores the breath-taking dynamics of bubbles, from square bubbles to rocket bubbles, tornado bubbles to flying saucer bubbles! Find out more. Join Hobbycraft Cheltenham colleagues as they show you how to colour-in your very own Easter eggs! You'll be decorating 6 Easter eggs in this hands-on workshop, choosing from a range of colours and designs! Suitable for ages 4+ and their grown ups. Running Monday 15th, Wednesday 17th & Friday 19th April - and it’s free! Find out more. John Lewis Cheltenham is hosting a free, lovely storytime and singalong session for little ones today! Find out more. Green fingers assemble at Oakley Community Resource Centre for a delightful Community Gardening session, suitable for the whole family! Create a lovely container garden outside, or inside if its raining! Find out more. The Play Gloucestershire Easter holiday play scheme returns! The Play Rangers will be providing active and creative, adventurous, save play for school aged children, young people and their families. Sessions are open access, meaning you can come and go as you please - and it’s free! Meet today at Sunrise Avenue Playing Field, Bishops Cleeve from 10am - 4pm. Find out more. Come and enjoy Victorian themed activities at the Holst Birthplace Museum! Today’s drop in activity is ‘Easter basket making’ - perfect for all of those eggs! This activity is free with general admission. Find out more. Greystones is offering a day of Easter-themed, family-friendly activities and crafts! This event is free to attend but there may be a small charge for some activities. Find out more. A family Easter event not to be missed! Organised by SPTM Big Local, come along to Gas Green for this cracking kid's afternoon! With craft activities, inflatables, hot food and refreshments! Find out more. The Snow Sisters will be visiting Smokey Joe's for a morning of Springtime fun this morning! Children can enjoy singing songs, two hours of crafts, stories and taking lots of lovely photos! Find out more. 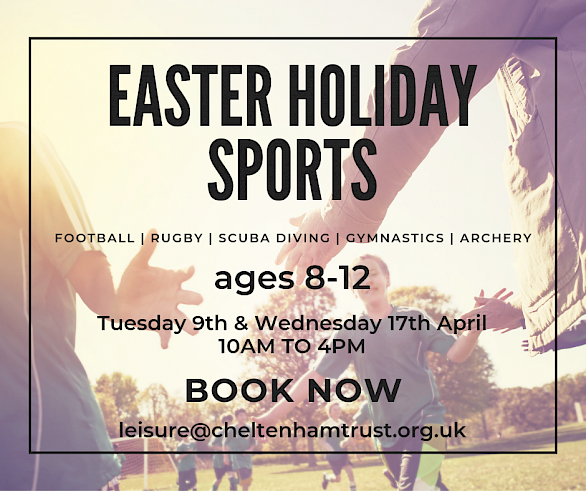 The Play Gloucestershire Easter holiday play scheme returns for the last Cheltenham date at Springfields Park Springbank, from 10am - 4pm. Find out more. Roll up, roll up! Gather ‘round and join circus owner, producer, artist and author Nell Gifford as she introduces her debut children's book ‘Nell and the Circus of Dreams’. Nell will take little ones (ages 3+) into the circus tent and beyond in this magical story time, as well as revealing some surprising facts about circus life; sharing her inspiration for the story. Find out more. Leisureat has a brand new, exciting sports programme which is now open to book! The fitness team will be running two exceptional multi-sports days to give children ages 8 - 12 a chance to enjoy new experiences, incuding archery and scuba diving! Simply drop your children in at 9:30am and collect them at 4pm! Find out more. Calling all mini Monets! John Lewis Cheltenham for some creative egg painting with Imogen Harvey-Lewis this morning! Find out more. Get in line for an evening of glad-rag-grabbing, bargain-bagging at The Swan Clothes Swap! The event is free to attend - all you need to do is bring in some of your own clothes to swap with someone else. Find out more. Fly2Help Easter Quiz is the perfect way to have a good time while supporting charity. Hop along to The Flying Shack, where food and fun will be plentiful - all for a good cause! Find out more. Don’t forget to check out our trail guide here - there’s some fab hunts going on today! Ready, set, jump into Friday with these exciting Easter Trampoline Sessions at Cotswold Clubhouse. These special Easter sessions, suitable for ages 5 - 14, are 1 hour long, so plenty of time to learn new trampolining skills, build confidence, and do exciting tricks! Find out more. While you’re at the Clubhouse, why not stop by and enjoy some colouring in the café! Other Easter festivities include face painting and a special Easter Craft Room, where children can make Easter baskets (chocolate eggs included), cards, wreaths, bunny arts & crafts and carrot footprints! Also running Saturday 20th. Find out more. Gather round and listen up for storytelling-time at Greystones! From stone circle magic to a sulky sun goddess, Chloë of the Midnight Storytellers will warm your evening with thrilling folktales and legends from around the world! Suitable for all the family from age 7, this is real live campfire storytelling packed with giggles and gasps - complete with hot chocolate! Find out more. This one has snuck through due to total newness! For the first time ever, Brasserie Blanc is hosting a fabulously fun, children’s Easter Sunday celebration! From 10:30am, children can enjoy an egg-cellent egg hunt and a beautiful bonnet making competition! Find out more. Something creative and tasty from Hobbycraft Cheltenham! Children aged 5+ and their grown ups are welcome to join colleagues instore to decorate a chocolate Easter egg, complete with coloured icing and embellishments so you can wrap it up and give to someone special this Easter! Find out more. Waterstones Cheltenham has a treat in store for Poppy and Sam fans, and to celebrate one of the best books ever, there’s some exciting Poppy and Sam games and activities, running all day! Find out more. We’re head over hats for the Regent Arcade afternoon tea event, especially for little ones to celebrate the season in a civilized manner - sort of! We’re all invited to come and join the Mad Hatters Tea Party, with plenty of 'drink me' shrinking fun, and 'eat me' growing treats to serve! The Queen of Hearts will be there to celebrate too, with her favourite game of flamingo croquet. Find out more. We hope you enjoyed your Easter egg hunts yesterday - there were at least TEN on in Cheltenham and there’s a couple going on today! Don’t forget to check out our trail guide here and check back through are ‘All Week’ section at the top for things to do today! Head over to Hobbycraft Cheltenham for their free Kids Craft Club workshop, Slime Fillable Eggs. Store colleagues will show you how to make your very own batch of slime from a range of colours and textures! You’re then welcome to take it home in a brightly coloured, fillable egg of your choice! Suitable for ages 4+ and their grown ups. Also running Wednesday 24th and Friday 26th April. Find out more. Nothing like a ‘Victorian Spring Clean’ to clear away the cobwebs! Free with general admission, join an expert for a talk in the basement - it’s not as spooky as it sounds! From tea leaves to gas, find out how clean the avery Victorian house really was! Find out more. Easter Monday sees the return of the annual Easter train - the GWSR Easter Eggspress special! Climb aboard a train at Cheltenham Racecourse for this 'eggcellent' event which will take place at Winchcombe Station. As you travel through the countryside, try one of the free children’s quiz sheets with Easter puzzles and games, then look forward to the free Easter activities and meeting the Easter Bunny when you arrive on the platform! Find out more. That's all 'yolks'! Be sure to keep a lookout for more Easter events and activities popping up on the website, and don't forget you can browse the site any time and find activities by day, age, cost, distance and more!